I’ve just finished a first semester of a Masters in Educational Technology from UBC. One of the great pleasures of my first classes was exploring the theoretical frameworks that support ideas I’ve been thinking about for years as I have been exploring the world of education as a filmmaker and an entrepreneur. The research approach I’m most excited about is Activity Theory. It’s a way of modeling a human community that gives special attention to human agency. It looks at what each person is doing and focuses in on their own subjective experience, trying to understand why they are doing what they are doing, in terms of intention as well as social context and their own perception of expected behavior. By looking at each person as a subjective and intentional actor within the system, a sophisticated and telling portrait of a situation emerges. It is actually a lot like making a documentary film. Activity Theory places special emphasis on the tools being used in any given situation. It also incorporates a wide open notion of community that includes all the relevant actors, near and far. The approach can be quite amorphous and requires a lot of tailoring, but it is also immensely powerful and is a key tool for understanding and designing human-computer interactions. 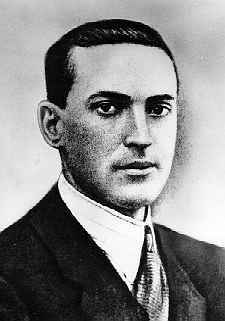 I came to Activity Theory through my interest the Russian educational psychologist Lev Vygotsky, whose pioneering work in the early part of the last century is the subject of a film I made about math education in India. Vygotsky’s work forms the basis of modern Activity Theory. Separately, Vygotsky and his ideas relating to social constructivism have inspired a whole other school of thought called Actor-Network Theory (ANT) which takes an entirely different approach towards modeling human interaction and is generally seen as incompatible with Activity Theory although I have come to believe the two approaches can be synergistic. 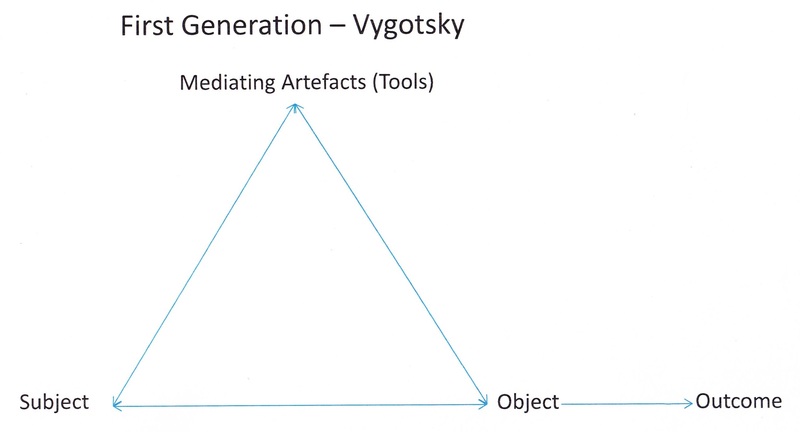 A core idea of Vygotsky’s social constructivism is that our relationship to the world around us is mediated by the tools we use. Language is the original tool and our very ability to think co-emerges with our use of language, and from there, in every case, the tools we use shape and mediate our strategies and understandings. 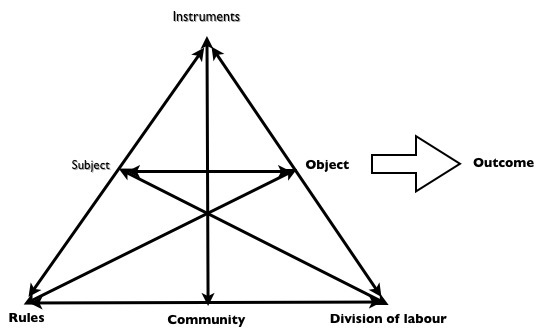 In Activity Theory, this original notion of mediation becomes an elegant, triangle diagram of “a complex, mediated act” which holds the subject, the object, and the tool in instantaneous balance. In Actor-Network Theory, the idea of mediation manifests quite differently, as the image of a person shooting a gun. An analysis here plays out like the American gun-control debate. 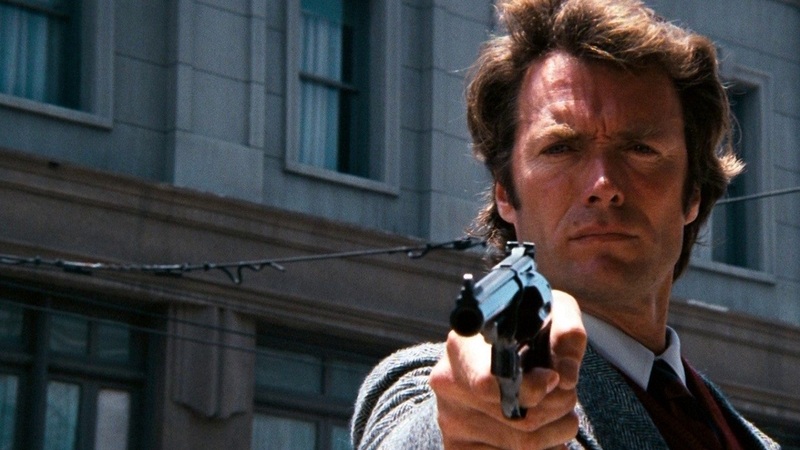 If you look at the Actor-Network Theory example of a man with a gun through the lens of Activity Theory, the person shooting the gun clearly has the agency and the intention; the gun is the tool used towards an objective and this use must be seen in the context of the rules and roles of the greater community. Actor-network theorists, in contrast, are interested in a more sinister dimension involving Machiavellian power manipulations; Actor-Network Theory recognizes that the gun as a tool, is already loaded, so to speak, and has a certain amount of embedded agency of its own. Both of these theories offer useful insights, although they also can be seen, understandably, as incompatible. My resolution is to treat them like the Google Maps overview and streetview tools. ANT, or actually the Socio-Technological Interaction Network (STIN) offshoot, offers a fantastic flattened map of a human community mediated by the tools used. But if you want to jump down to get a more realistic perspective view of what any particular point on the map looks like in real life, switch to the perspective view of Activity Theory. But with Activity Theory, while one gets a clear view of that is happening in a given moment at one point on the map, one quickly loses one’s sense of the whole. So you can toggle back to the STIN overview. And while these two perspectives can’t be easily integrated into a single view, this dynamic toggling back and forth can be very powerful. Part of me thinks this could make an amazing piece of community mapping software. But I also think that a metaphor can be a powerful tool in itself, and simply describing this analytical technique with words will ultimately be more effective than automating it. Better yet would be to find an opportunity to put these ideas relating to the art of designing collaborative educational environments into practice.